Warning: BusyMom said this should have a tear-jerker warning. Consider yourself warned. 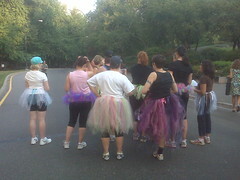 It's a long story, but Catherine of Her Bad Mother asked us to make tutus and run in Central Park at BlogHer 10 as a benefit for her nephew, Tanner. I was taken with this idea, but I was a bit baffled about how to transport a whole tutu across the country without mangling it, so I came up with a brilliant plan. 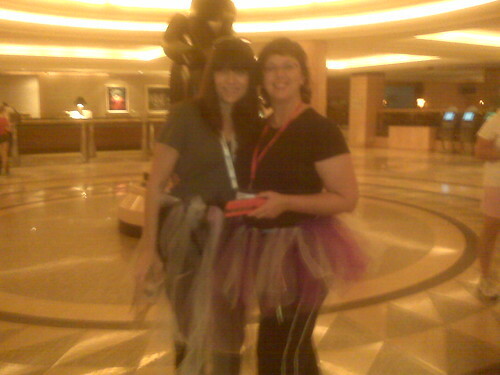 I would buy yards of tulle, cut them into strips, and offer people at BlogHer the chance to assemble their own tutus before the benefit race. I realized that cutting 110 yards of tulle in a hotel room in the compressed timeframe of BlogHer wasn't going to happen, so I had to cut it at home. 110 yards into 4-inch wide strips...It was a big deal. I decided to cut tulle at my folks' house on the kitchen table, since my only table is too small. And because my parents are lovely, lovely people, they decided to help me. You mom bloggers know how it is when your kids "help" you make cookies? It was kind of like that. My mom has bad arthritis and couldn't work for very long, so my dad stepped in. My 90% blind, not terribly steady dad. But dang it, there was work to be done and he was going to do it. He and I fumbled and twisted tulle and cut at funny angles and made mistakes, and there were times I felt like either screaming or running away. But I took deep breaths and took his help in the spirit it was offered. We got that damned tulle cut into strips and we looked good doing it. By the time I got to Central Park, I had two sprained ankles and couldn't run. 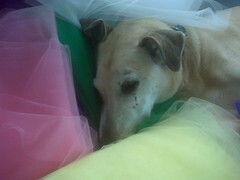 I did have a walk down 6th Ave. to the park in gorgeous, Lakers-colored tutu, and many others at BlogHer got tutus made by volunteers who did tutu construction at the People's Party. Three weeks later my dad was dead. Making those "Tutus for Tanner" was the last father-daughter project we ever worked on, and it turns out I'm thankful for those goofy, crazy hours of frustration and screwed-up teamwork. That's life, isn't it? You just decide to do things and do your best under the circumstances, and sometimes you get a gift you don't expect, a gift that you wouldn't trade all the gold in Fort Knox for. And then you go on to write sentences that end in prepositions, and life goes on. You know my sister's name was Laura. At BlogHer 2007, I got a new friend, whose name is Laurie. Which is far enough from Laura to not squinch my heart up every time I say it, but close enough to make me think that sometimes families aren't necessarily made by genes. It also makes me think that having someone you really love take your photograph somehow makes you prettier. Photo by Laurie White. Used by permission. All rights reserved. Random Idjit: "The happiest people I know don't have blogs because they are too busy having real lives." Suebob: "The reason people don't have blogs is because they don't have anything interesting to say." Random Idjit: "You're exploiting your kids/your family/your friends/yourself to make money from your blog." Suebob: "If you knew how to make money making anything more creative than Slurpees, maybe you wouldn't be so jealous." Random Idjit: "I think people that need to put their lives on view all the time have something wrong with them." Suebob: "Your pathological need to hide from the world is baffling to me." Random Idjit: "What makes you think everyone wants to know your opinion all the time?" Suebob: "The way they find out my opinion is by seeking it out. 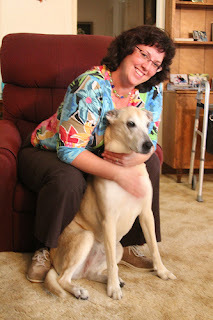 As far as I know, no one has ever been forced to come to my blog or twitterfeed at gunpoint." Random Idjit: "I just don't understand what you're trying to accomplish."